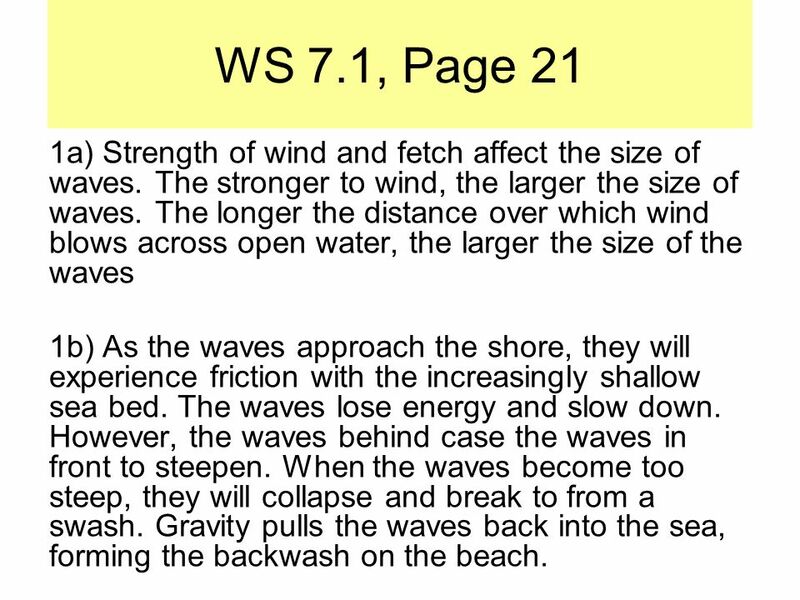 WS 7.1, Page 21 1a) Strength of wind and fetch affect the size of waves. The stronger to wind, the larger the size of waves. The longer the distance over. 1 WS 7.1, Page 21 1a) Strength of wind and fetch affect the size of waves. The stronger to wind, the larger the size of waves. The longer the distance over which wind blows across open water, the larger the size of the waves 1b) As the waves approach the shore, they will experience friction with the increasingly shallow sea bed. The waves lose energy and slow down. However, the waves behind case the waves in front to steepen. When the waves become too steep, they will collapse and break to from a swash. Gravity pulls the waves back into the sea, forming the backwash on the beach. 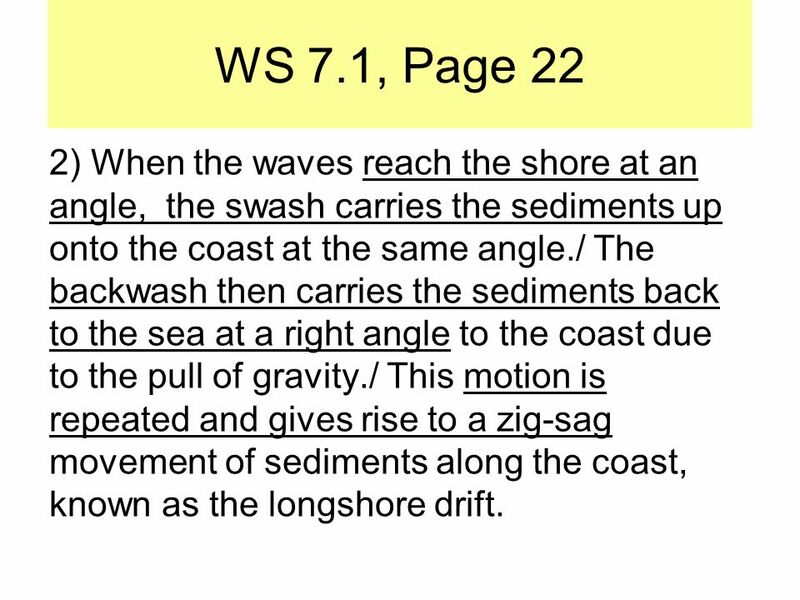 2 WS 7.1, Page 22 2) When the waves reach the shore at an angle, the swash carries the sediments up onto the coast at the same angle./ The backwash then carries the sediments back to the sea at a right angle to the coast due to the pull of gravity./ This motion is repeated and gives rise to a zig-sag movement of sediments along the coast, known as the longshore drift. 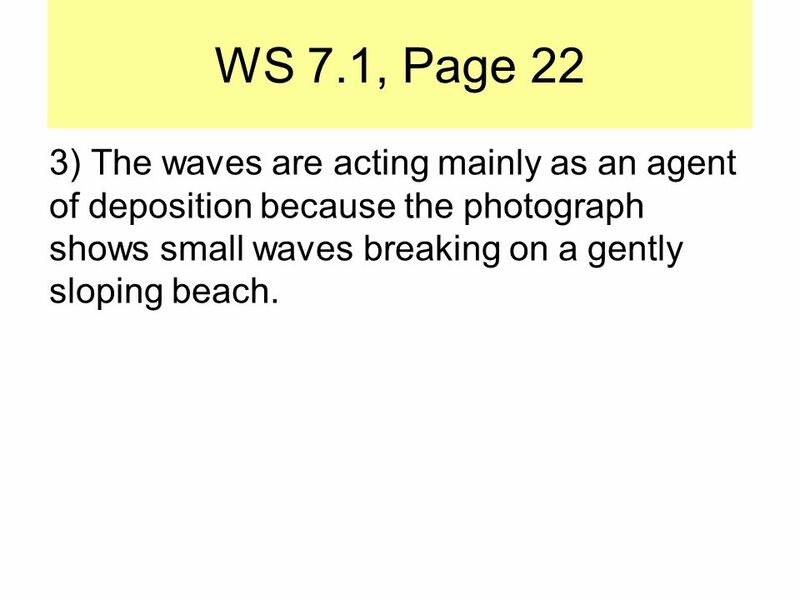 3 WS 7.1, Page 22 3) The waves are acting mainly as an agent of deposition because the photograph shows small waves breaking on a gently sloping beach. 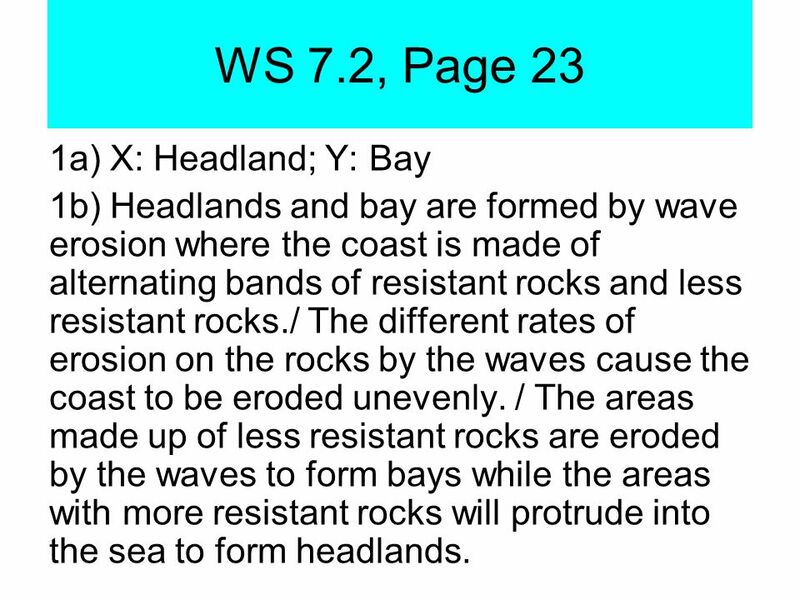 4 WS 7.2, Page 23 1a) X: Headland; Y: Bay 1b) Headlands and bay are formed by wave erosion where the coast is made of alternating bands of resistant rocks and less resistant rocks./ The different rates of erosion on the rocks by the waves cause the coast to be eroded unevenly. / The areas made up of less resistant rocks are eroded by the waves to form bays while the areas with more resistant rocks will protrude into the sea to form headlands. 5 WS 7.2, Page 24 2a) Z is a tombolo. A tombolo is a narrow strip of sand that connects the mainland to a small island nearby or an outcrop of rocks. 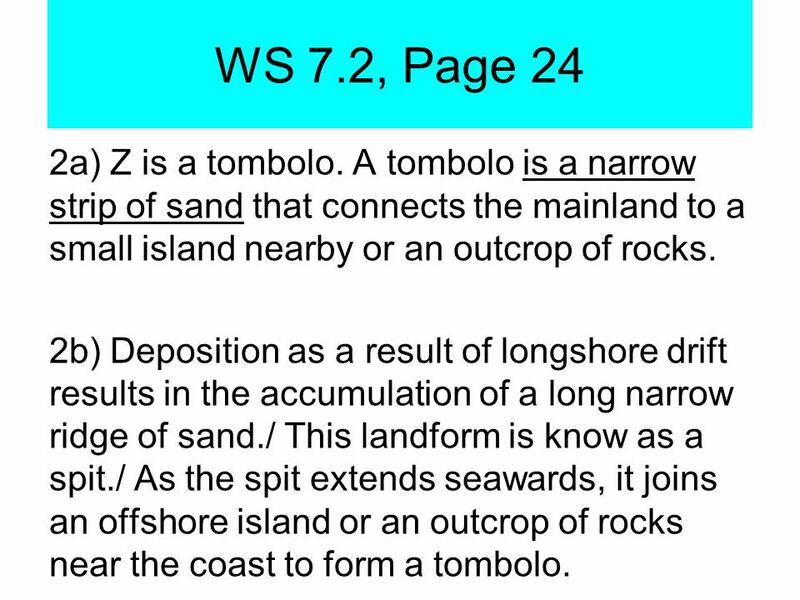 2b) Deposition as a result of longshore drift results in the accumulation of a long narrow ridge of sand./ This landform is know as a spit./ As the spit extends seawards, it joins an offshore island or an outcrop of rocks near the coast to form a tombolo. Download ppt "WS 7.1, Page 21 1a) Strength of wind and fetch affect the size of waves. The stronger to wind, the larger the size of waves. The longer the distance over." CH 16 The Dynamic Ocean Ocean water is in constant motion and powered by many forces Forces include wind, Coriolis, gravity, density differences Ocean. Waves, Beaches, and Coasts Prepared by Betsy Conklin for Dr. Isiorho. 2.4	How do coastal processes shape the land? Part B. © Boardworks Ltd of 8 This icon indicates that the slide contains activities created in Flash. These activities are not editable. For more detailed. © Boardworks Ltd of 43 These icons indicate that teacher’s notes or useful web addresses are available in the Notes Page. This icon indicates that. Landforms of coastal deposition L/O: To explain how the following landforms are created by coastal deposition 1)Beaches 2)Spits 3)Tombolos and Bars. Wave Action Chap 11, Sec 2. Essential Questions (Chap 11, Sec 2) 1. How does a wave form? 2. How do waves change near the shore? 3. How do waves affect. Coastal Processes and Landforms Erosional and depositional landforms of coastal areas are the result of the action of ocean waves. Erosional LandformsDepositional. BackwardForwardHomeExit BackwardForwardHomeExit I. What are the major processes operating along coasts? 1.1 What is wave generation? Download Flash Player. The Sea Creator and Destroyer. Definitions of Coastal Regions: The shore is the area on the coast which covers the furthest low tide mark to the highest elevation where waves affect. GCSE Geography Unit 2 – Natural Environment Topic 1 – Coastal Landscapes Lesson Aims: Able to describe the characteristics of destructive and constructive.